At Shore Wealth Management, we have adopted the words "Your Goals are our Focus" as our motto. They act as a constant reminder that the most important thing we do is help our clients and their families meet their financial goals. One of the ways we do this is by continuing our education and enhancing our expertise. 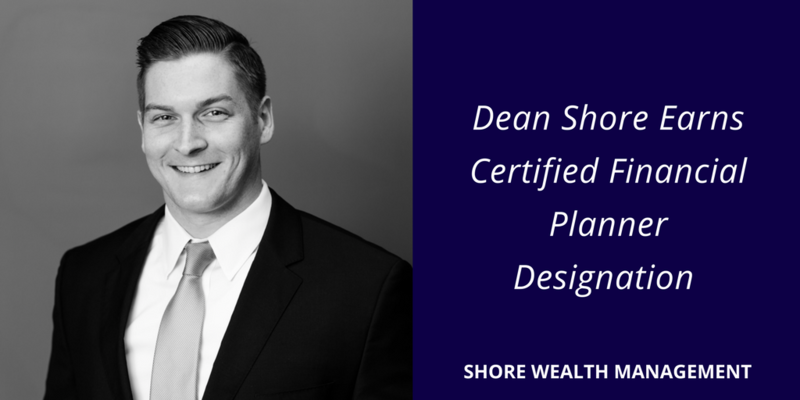 We are excited to announce that Dean Shore has earned the CFP® designation. Unlike many financial advisors, CFP® professionals must develop their theoretical and practical knowledge by completing a comprehensive course of study at a college or university offering a financial planning curriculum approved by the CFP Board. CFP® professionals must pass the comprehensive certification exam, which tests their abilities to apply financial planning knowledge to real-life situations. The exam covers the financial planning process, tax planning, employee benefits and retirement planning, estate planning, investment management and insurance. CFP® professionals complete several years of experience related to delivering financial planning services to clients before earning the right to use the CFP® certification trademarks. This hands-on experience confirms that CFP® professionals have practical financial planning knowledge to provide quality financial solutions. When it comes to ethics and professional responsibility, CFP® professionals are held to the highest of standards. The Rules of Conduct require CFP® professionals to put the client’s interests ahead of their own to provide financial planning services as a “fiduciary”—always acting in the best interest of their clients. Dean Shore is a registered Financial Advisor with Cetera Advisor Networks LLC. He holds his CERTIFIED FINANCIAL PLANNER™ designation, Series 7 and 63 securities registrations and IL Insurance license. Dean helps clients of the firm with asset management strategies, retirement planning, education planning, risk management and estate planning. Dean also assists with the day-to-day operations at Shore Wealth Management. Outside of the office, Dean and his wife, Hayley, enjoy spending time with friends and family, golfing, traveling, and hiking with their dog. We would like to offer you a no-obligation, second opinion consultation. Send us an email at [email protected] or call 217-709-0001 to see how your finances could benefit from our knowledge and experience.